An assortment of pottery products. 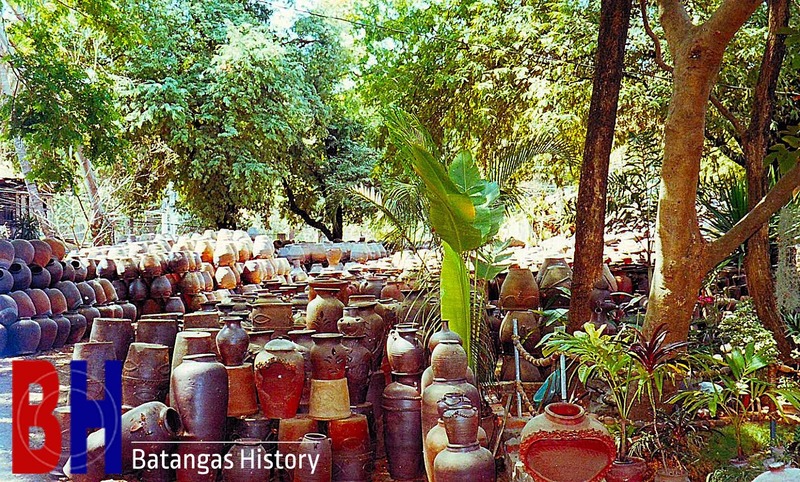 Arguelles noted that the growth and development of the pottery industry in Palyocan had been “very slow as can be very well seen in the output of the last several years.” He added, however, the an increase in demand for pottery and the influx of similar products from other pottery districts in the Philippines as well as Japan and China posed challenges for the development of the industry in the barrio. The potters of Palyocan, Arguelles wrote, used “sticky clay which is generally obtained from the lowlands beside the Calumpang River.” It was grayish in color and alluvial in nature, i.e. eroded soil or sediment “reshaped by water in some form and re–deposited in a non–marine setting3.” It had been deposited on the banks of the river by the frequent overflow of its waters. “First of all, the clay is molded until it is rendered very sticky and refined. This is done on any convenient place with a smooth surface, usually on a wooden table. This completed, the clay is divided into portions, much of which is enough to be made into one complete pot. These pots vary in size and kind. Then the shaping of the clay into pots is done. It is fixed on the revolving table for here the shaping with the view of getting symmetry for the pot is better obtained. Sometimes, decorations are carved on the outside of the pots. This done, the pots were arranged “among layers of bamboo fuel to be burned.” Arguelles referred to this process as a “beautiful spectacle” which could last “for an hour or two.” He did say that this process was both “wasteful and uneconomical” and that the local potters would be better served by using modern kilns. The potters created “dozens of types of pots” depending on their shapes and uses. These could be dishes, frying pans, flower pots or stoves all made the same way but shaped and styled differently. 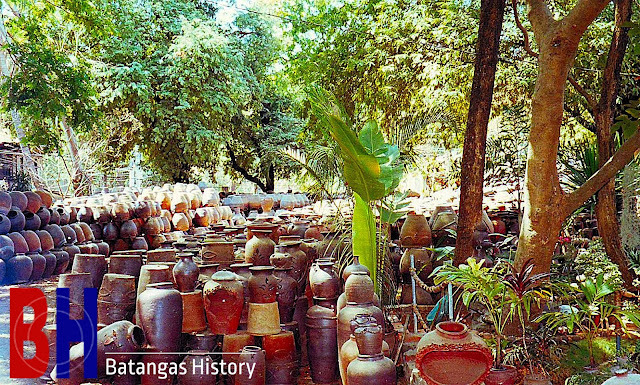 In conclusion, Arguelles wrote that while the pots made in Palyocan had an “absence in taste” and that the potters could probably benefit from more technical know–how, neighboring towns and provinces were all supplied with pots manufactured in Batangas. Because these markets were “promising” and the demand for pottery products was rising, he also expressed hope that there would be improvements in the methods of making pots in the barrio of Palyocan. 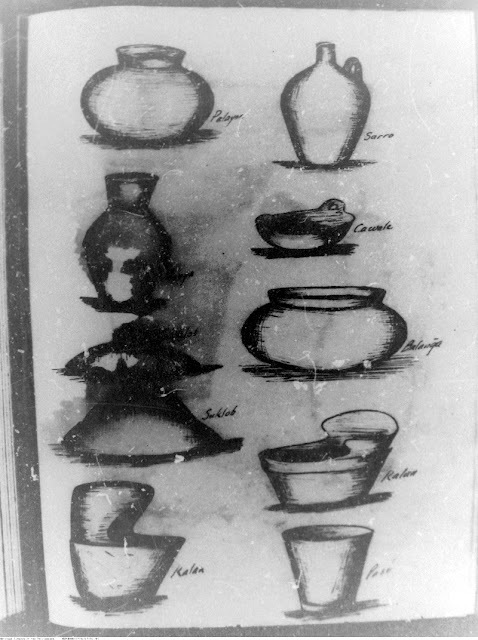 Arguelles' drawings of pots made in Palyocan. 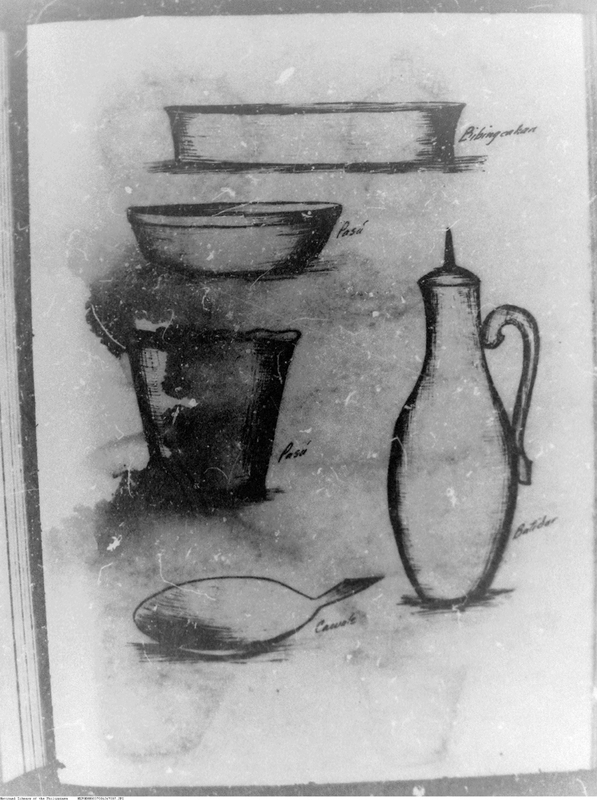 A second page of drawings made by Arguelles of pots made in Palyocan. 1 “Pot-making in Batangas,” by Aurelio P. Arguelles, 1917, online at the National Library of the Philippines Digital Collections. 2 “A Reconstruction of 15th Century Calatagan Community,” by Angelo G. Bernardo.